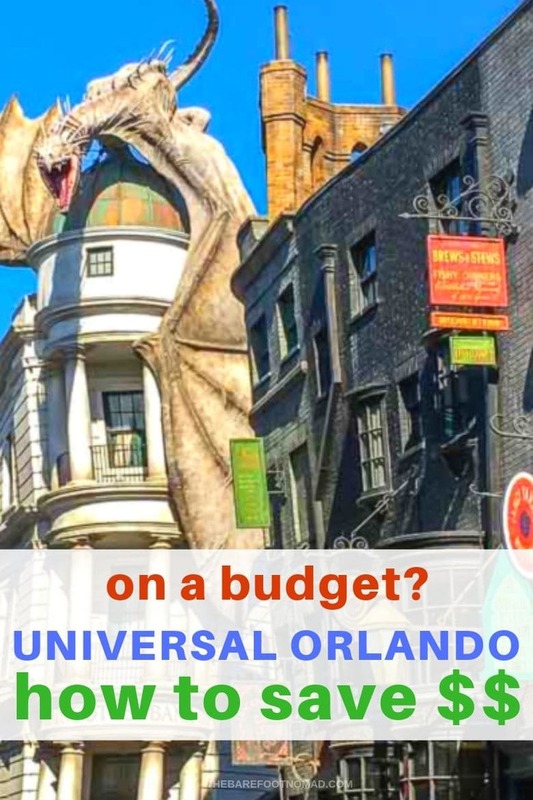 Looking for Universal Orlando tips to make the budget last longer, save you time and reduce the stress load? 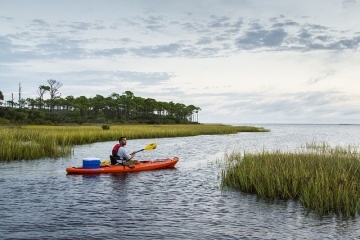 Planning a major holiday with the family to Florida and suddenly overwhelmed by it all? We can help! 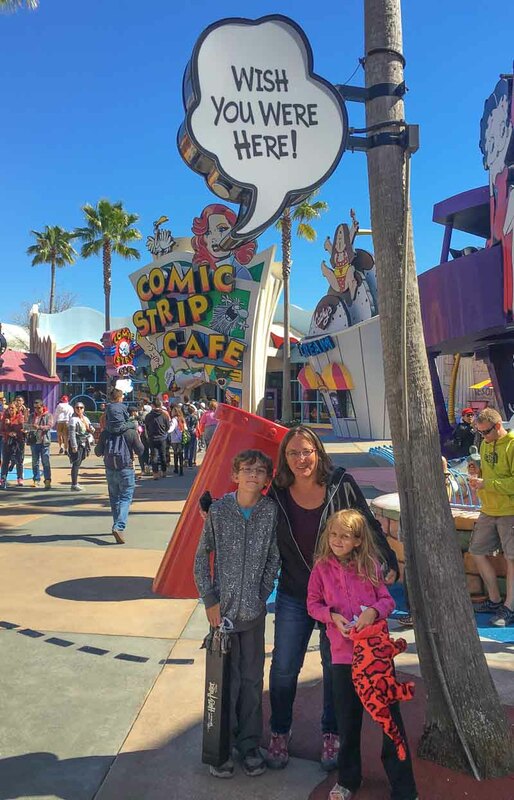 We visit the Universal Orlando theme parks every chance we get and each time compile notes and tips on the best way to maximize our time there for the next outing. 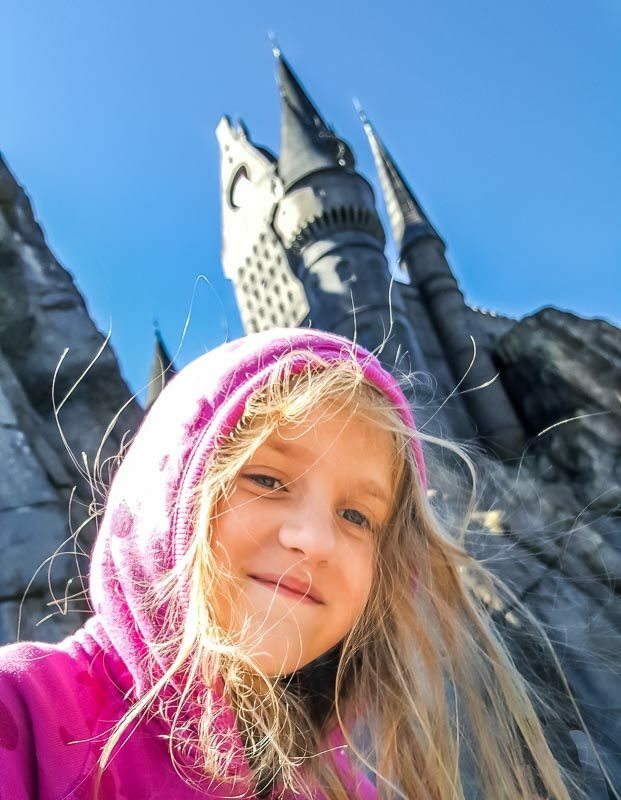 Like a lot of families visiting Orlando, some of our favorite family memories occurred during our time at the Wizarding World of Harry Potter. I’m honestly not sure who enjoyed it more – us or our kids! Universal has done a stunning job of making the entire experience special and memorable! 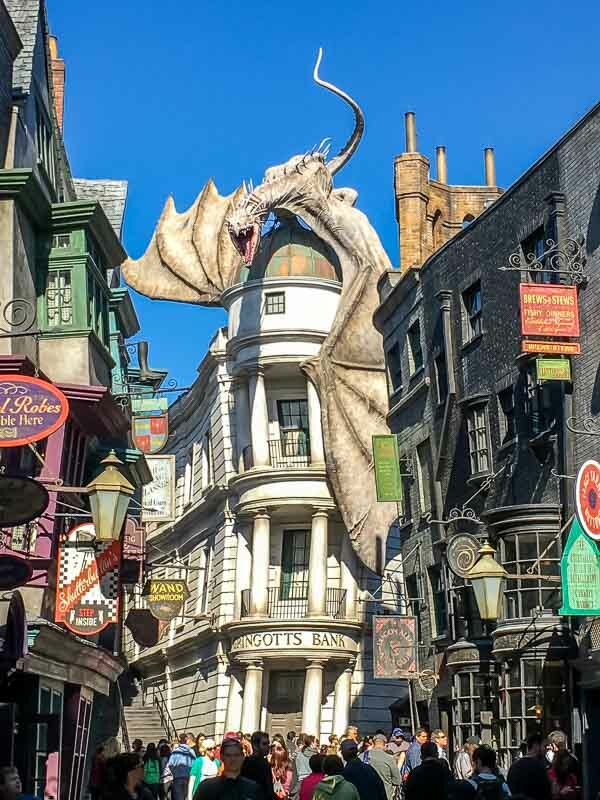 While we’re huge fans, it’s no doubt a visit to Universal Orlando is expensive, so you’ll want to make the absolute most of your visit to the three Universal Parks, and come home with wonderful memories for yourselves! It’s no secret that you could spend weeks at Universal and still not see every show, enjoy every ride, and snack at every restaurant. We’ve got tips that can help save you money, and just as importantly, help save you time and hassle. Now that Universal’s added the spectacular Volcano Bay water park, there are now three full sized parks here: Universal Studios, Universal Islands of Adventure, and Volcano Bay. Each of the three Universal Orlando parks is huge, and you’ll only get to sample a portion of the rides, food, and activities in a park in one day. Three days will let you dedicate a day to each park, while four days will give you a chance to go back to your favorite rides and attractions, and catch anything you missed the first time around. 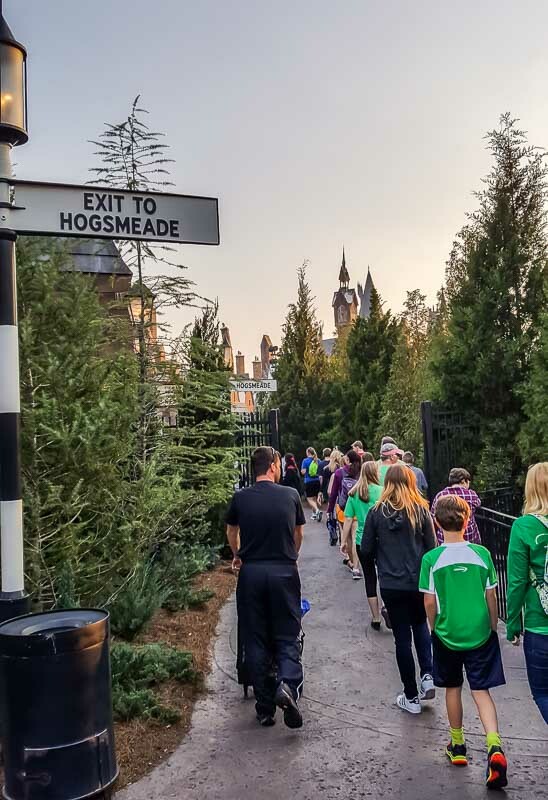 If you’re a Harry Potter fan, you’ll need two days to check out Hogsmeade (in Universal Islands of Adventure) and Diagon Alley (in Universal Florida). You can visit both Hogsmeade and Diagon Alley in a single day, but it would be a rushed affair, and you would miss a lot of the details that make each experience unique. We actually stayed off property during our last visit, since we had plenty of time to visit. Ocean Florida offer a range of villas within Florida, including some nearby to Universal. Many of the Universal Orlando hotels include Unlimited Express Passes and early park access to help you beat the morning rush. Since the hotels are on site, you’ll be able to use the free shuttle, saving money on parking and time driving to the parks. All on site hotels offer Early Park admission (one hour before regular opening hours) and free transportation to the Parks and CityWalk. Other perks include complimentary delivery of merchandise from the Resort to your hotel, appearances by Universal Orlando characters, and priority restaurant seating (for Loews Portofino Bay Hotel, Hard Rock Hotel, and Loews Royal Pacific Resort). There are a few hotels onsite, including Cabana Bay Beach Resort, Loews Sapphire Falls Resort, Leows Royal Pacific Resort, Universal’s Hard Rock Hotel, and Leows Portofino Bay Hotel. 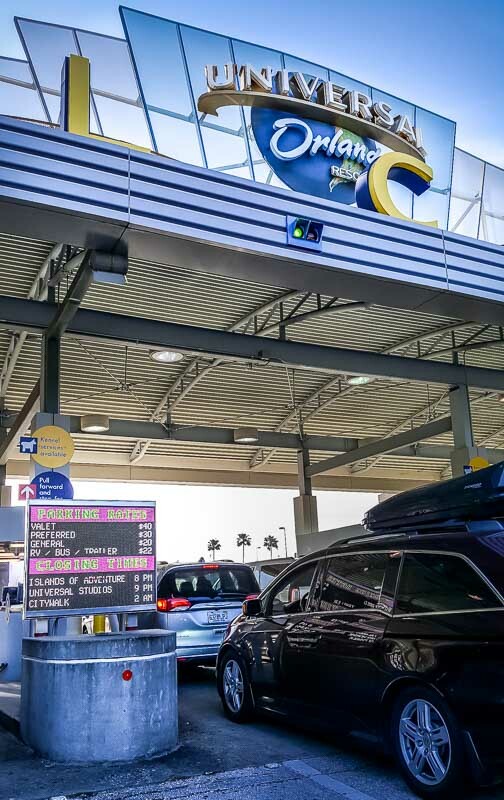 The hotels include a Free Universal Express Unlimited, which is worth up to $89 per person, per day (not offered at at Loews Sapphire Falls Resort or Cabana Bay Beach Resort). 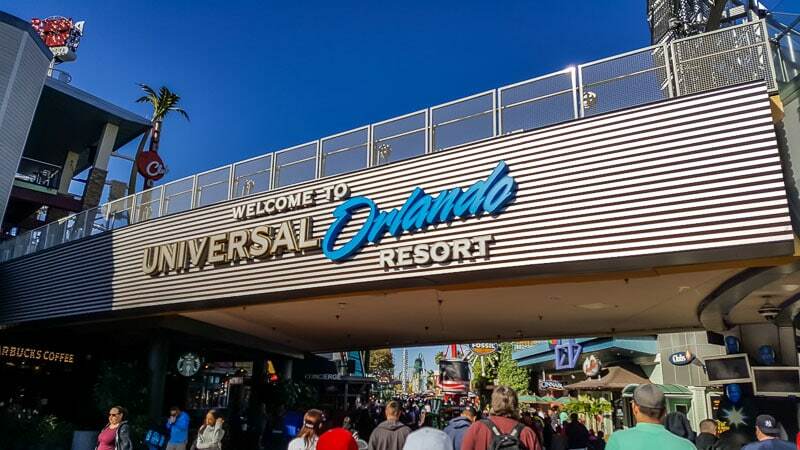 Check prices for hotels near Universal Studios Florida. The last thing you want to do on your trip to Universal is spend a lot of time waiting in line buying tickets. 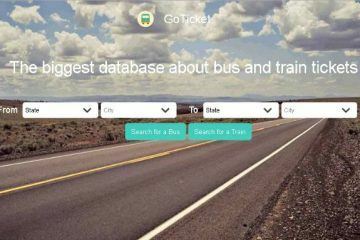 You can save a lot of time, and even a fair bit of money, by buying tickets online in advance. We’ve heard great things about buying passes in advance on Undercover Tourist. Unlike a lot of other sites, taxes are included up front (so no surprise fees at the end), AND shipping is free. Plus, you’ll save $42 over paying at the gate. 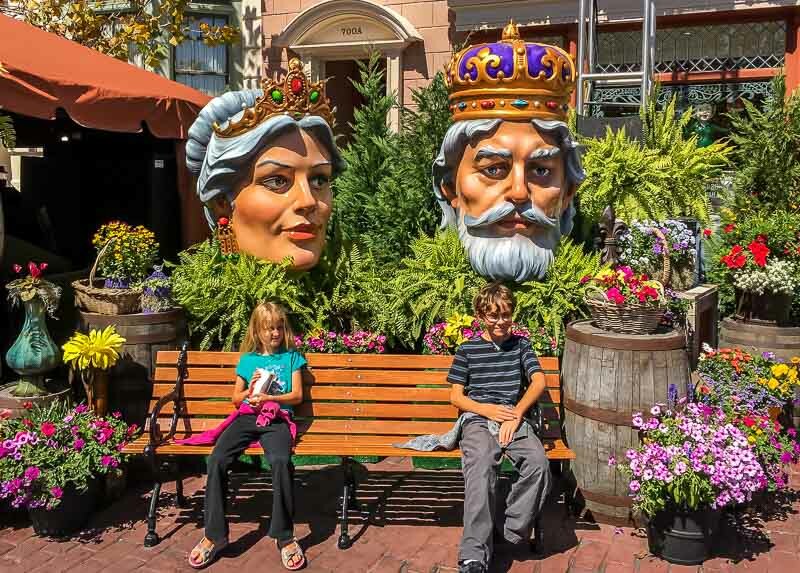 See all of Undercover Tourist’s Orlando ticket deals here. 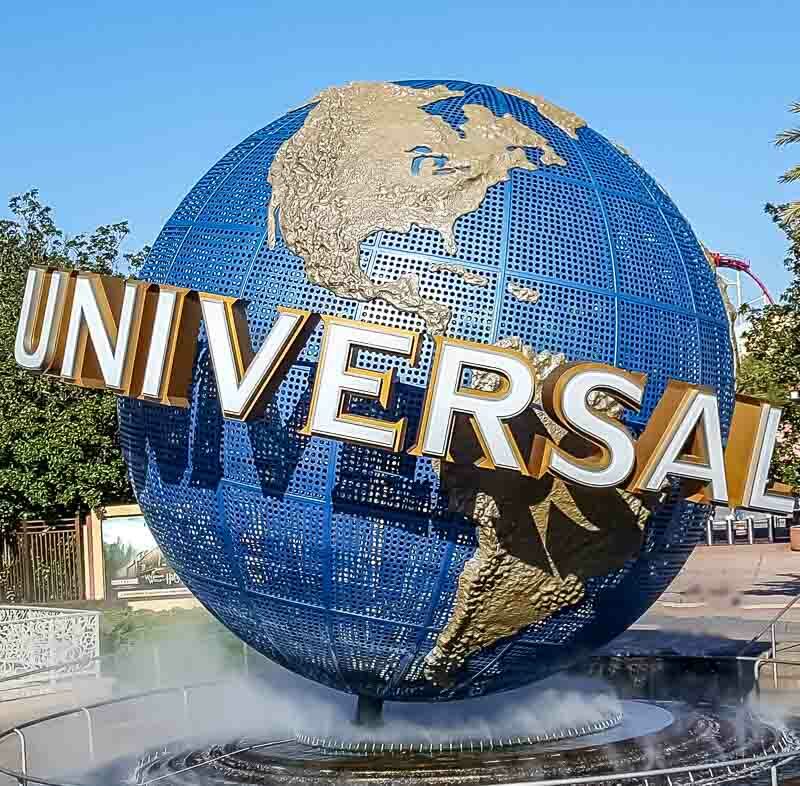 One of the best deals Universal currently offers is a buy a two day pass, get two days free deal. 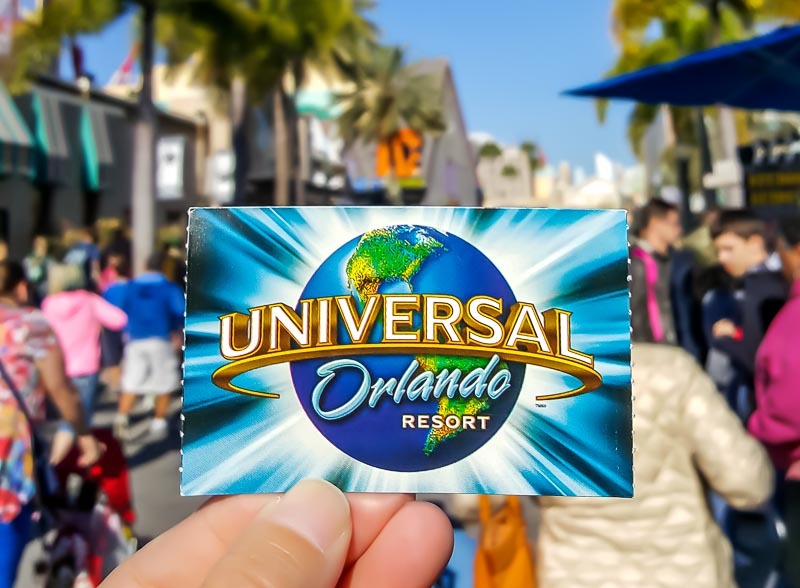 You can get this deal in two variations: four days for the price of two with a 2 park ticket to Universal Studios Florida and Universal’s Islands of Adventure. You can also get four days for the price of two with a three-park ticket for Universal’s Volcano Bay, Universal’s Islands of Adventure, and Universal Studios Florida. See the two day, get two days free deal here! If you’re only going for three days, you can still save with Universal’s special, where you get one extra day FREE if you buy a two day Park to Park pass. See prices for the two day Park-to-Park pass with one day FREE here. Get a two day Park to Park Pass if you want to access all of the shows, rides, restaurants, and attractions at the Wizarding World of Harry Potter. The Wizarding World of Harry Potter is split between the two Universal Florida parks (Islands of Adventure and Universal Studios). Hogsmeade is in Universal Islands of Adventure, and Diagon Alley is in Universal Studios. Both Hogsmeade and Diagon Ally have unique shops, rides and experiences, so you’ll want to go to both. You’ll also need a Park to Park pass to ride the Hogwarts Express! You could do both parks in one day, but you’d miss a lot, and you’d definitely be exhausted! 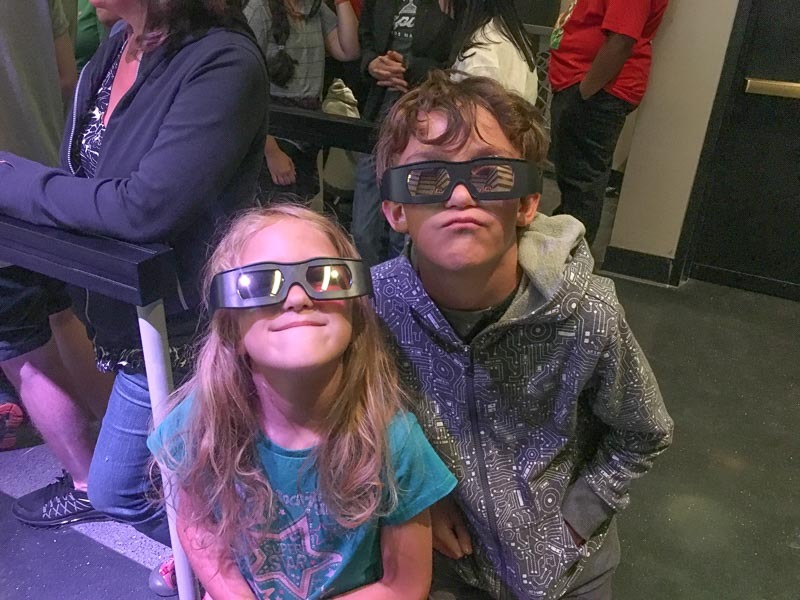 On our last trip, we spent two days almost exclusively checking out the Wizarding World of Harry Potter, and we still didn’t see and do everything in both areas! Check prices for a two day Park-To-Park pass, with two days FREE here. You can check out more of our specific tips for the Wizarding World of Harry Potter here. The free Official Orlando Resort app is a must. We used it to help plan our itinerary for the parks, and to let the kids mark the attractions they didn’t want to miss. 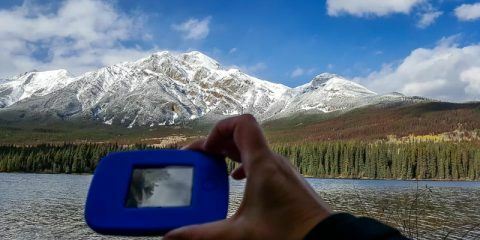 In the park, the app was indispensable! We used it to figure out where we were and to help decide where to go to next. Even better, the app is instantly updated with wait and show times. 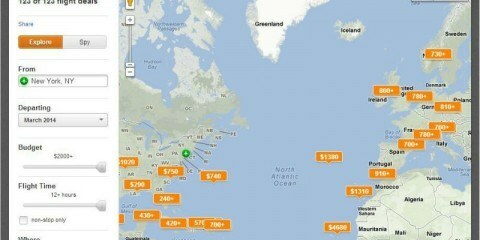 It’s also great for finding rides, and sorting out which restaurants to visit. Since the restaurant menus are included in the app, it also makes it really easy to pick a spot everyone in the group will enjoy. Here’s an extra helpful, time saving app tip! You can set up alerts for when ride wait times drop, saving you a lot of time waiting in line. FYI. If you don’t have a data plan, don’t worry, there’s free WiFi available throughout the Orlando Universal parks! Download the app on iTunes here. Get the app on Google Play here. 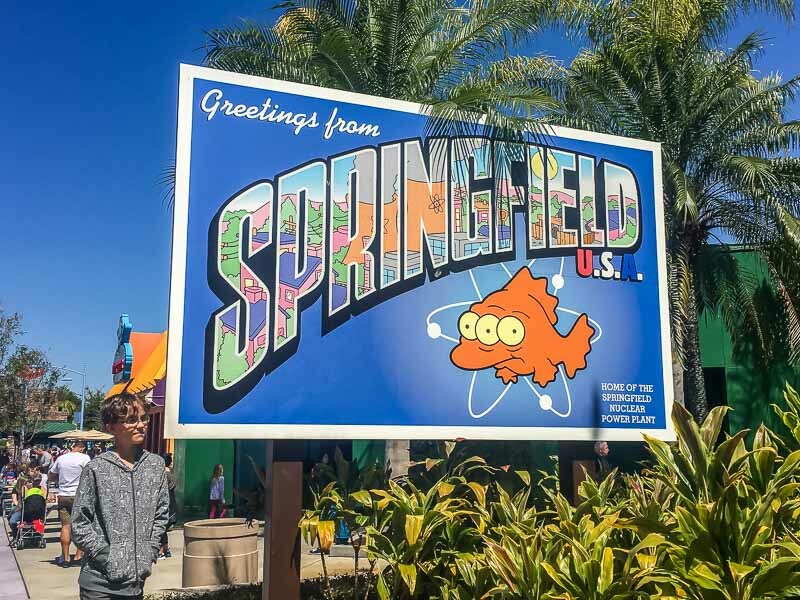 There’s so much to do at Universal Florida, and tickets are pricey enough, that you’ll definitely want to maximize your time. Go as early as your ticket allows, and stay right until closing, and you can maximize your time at the parks. 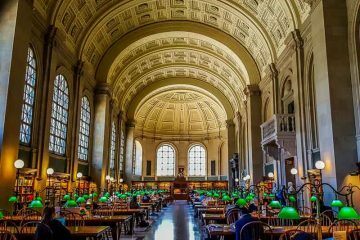 We’re not early birds, but we make an effort to go as early as possible, because we always find crowds to be much lighter in the morning before noon. Try to be at the park at least half an hour before opening, or get early access. Parking opens well before the gates to the actual park does so don’t be afraid to come a few minutes earlier. Also factor in the fairly long walk (around 10 minutes) from parking to the entrance, plus the time you’ll need to pass through the entrance line. Depending on which lot you’re coming from, there are motorized walkways from many of the parking areas that will speed your arrival. There are also a few ways to get early access to the parks, including staying at onsite parks, or getting Unlimited Express passes, which we talk about a little later in this post. We find that crowds at Universal really dropped off around 6 pm, in the three hours before closing, and stayed quieter until the park shuts down. This, or early morning, is the perfect time to take in the busier rides and attractions at Harry Potters Wizarding World. Since most people have experienced and left this area of the park by 6 the lines are way shorter. If you really want to enjoy that time, I suggest you grab an early supper (Three Broomsticks is our favorite Harry Potter restaurant) at around 4:30 pm and start checking out the rides around 6 pm. Make sure you check closing times! Closing times for Universal Studios and Universal Islands of Adventure were different when we visited. An Express pass lets you skip the normal lines and jump in the express line. We love the Express Passes, as they save us plenty of time in lines during the busier afternoon lineups. They’re not cheap (around $50 a person) however, when you factor in all it’s cost you to get to that point, that $50 could be the difference between getting to go on all the rides you wanted to and not. I’d say the Express Pass is almost essential during times when the Parks are crowded like Spring Break or Christmas. That said, if you’re going during a particularly quiet time, you may want to save some money and skip the Express Pass altogether. Important! You can’t use Express Passes at Fievel’s Playland, Pteranodon Flyers, Kala & Tai Nui Serpentine Body Slides or Ko’okiri Body Plunge, but we found they were a lifesaver for other rides in the Universal Parks. To save time in lines, use the alerts in the Official Universal Orlando® Resort App to let you know when a wait time has dropped (get it on iTunes here | Google Play). If you have the flexibility, try to avoid traditionally busy times like weekends, Christmas, Spring Break and summer holidays. Mid week during the off season could be your best bet. Orlando Informer has a helpful Universal Crowd Calendar. If you have kids, child swap is one of the best time savers around. You’ll need two adults for this, but it’s a fantastic perk. With a child swap, the entire family stands in line together. At the last moment, one adult waits with the children at the front of the line, while the other adult rides. When the first adult is done, the adults swap, and the adult who waited with the child first now goes to the front of the line. Just tell the greeter at the front that you want to use child swap. They do this all the time, so it’s a quick and efficient process. Our son also joined both of us when our daughter decided she didn’t want to go and got to ride twice with no lining up! For example, we used child swap on Escape from Gringotts, when our eight year old decided at the last moment that she didn’t want to go. That ride actually had a designated area for parents with small children off to the side complete with activities and monitors playing Harry Potter movie snippets. Since a lot of the Harry Potter themed rides have unique and entertaining happenings (like walking through Gringotts bank and having the goblins give you the evil eye), the designers at Universal have filled the lineup areas with plenty to see and do as you wait for your ride. If you don’t get in line, you might miss out on more than just the ride itself. If you want to get onto the rides even quicker, and don’t mind riding without the rest of your group, use the single rider line. This saves a lot of time waiting in line, especially on the busier rides like Escape from Gringotts and The Hidden Journey. Though it’s usually a different line than the normal one, you can still walk in with someone and hang out with them in line and then only do the ride on your own at the end. This is a great way to go if you already went on the ride together the first time and just want a quick second or third ride for yourself. It can also turn an hour and half Hulk roller coaster ride into a 15 minute ride! Just make sure to ask the attendants if there is a single rider lane since not all rides have it. Note: Due to it often being a different line, both the single rider lane and Express Pass lane might bypass some of the interactive areas the designers included for the regular line bound guests. If you want to see and experience everything pre-ride, you might want to stay in the regular lines the first go around. We get prime parking whenever we visit. It’s a great perk to have a short walk to our car at the end of a tiring day and it gets us out of the parking lot before most others. Preferred Parking also makes the walk to the gates entrance a lot faster and gets us into the park quicker. Preferred parking is currently an additional $10 a day more than regular at $30 (it’s $20 for regular parking). The only time I’d consider skipping Prime Parking would be if the parks are especially quiet (which is almost never!) or if we stayed in a very nearby hotel and took a taxi or Uber over. 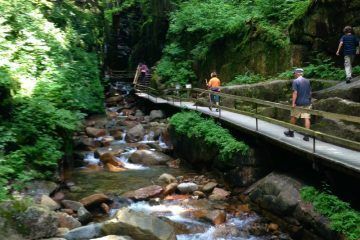 Of course, if you stay at one of the on resort parks you not only get in earlier but you also get free transportation. We debated getting the wands for our visit, but I’m so glad that we decided to buy one for each kid. 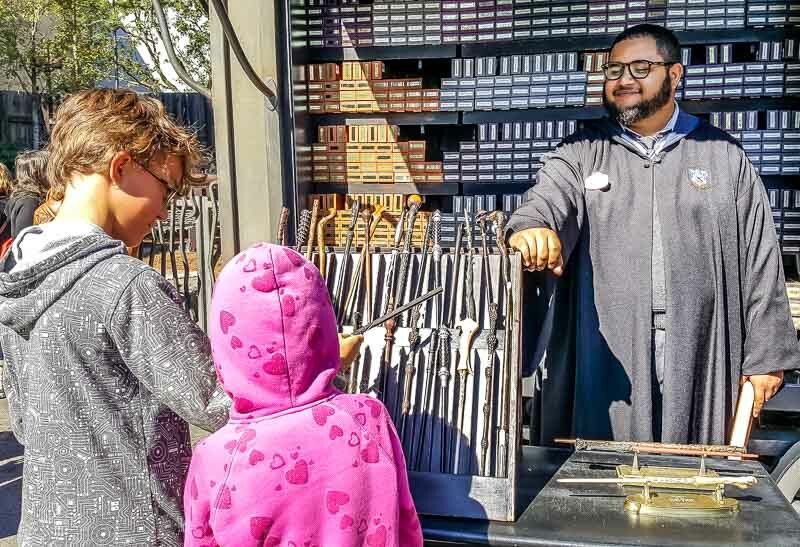 Wands bring shop displays to life, and really bring the Wizarding World of Harry Potter to life! Our kids used their wands at both parks. You can also bring your wand with you the next time you go to Universal Studios, so you only need to buy them once. 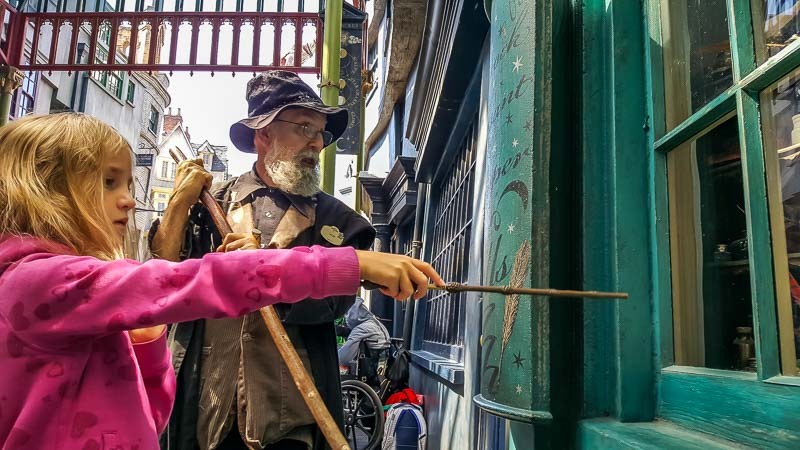 Wands cost about $50 USD per wand, so they’re not cheap, but our kids spent hours casting spells in shop windows at Hogsmeade and Diagon Alley. Don’t forget to look at the special map in your wand’s box! The special map that comes in your interactive wand’s box will guide you to wand spots in both worlds! Most articles will tell you to buy your wands at Ollivanders in Hogsmeade or at Wands by Gregorovitch in Diagon Alley. They both have a good selection of wands and the choosing ceremony as well however both places can be ridiculously busy! If there are big lines at Ollivanders or Wands by Gregorovitch (there always are), buy your wand at a cart instead, like we did. There are wand stands located throughout both Harry Potter Worlds with practically no one in line. We picked our wands up at a cart in Hogsmeade at the Islands of Adventure, near Harry Potter and the Forbidden Journey. Since the wand chooses the wizard, Dumbledore’s wand chose our daughter, and Sirius Black’s wand chose our son. The stand attendant was patient and helpful, and our kids got their wands much more quickly than if we’d stayed at Ollivanders. 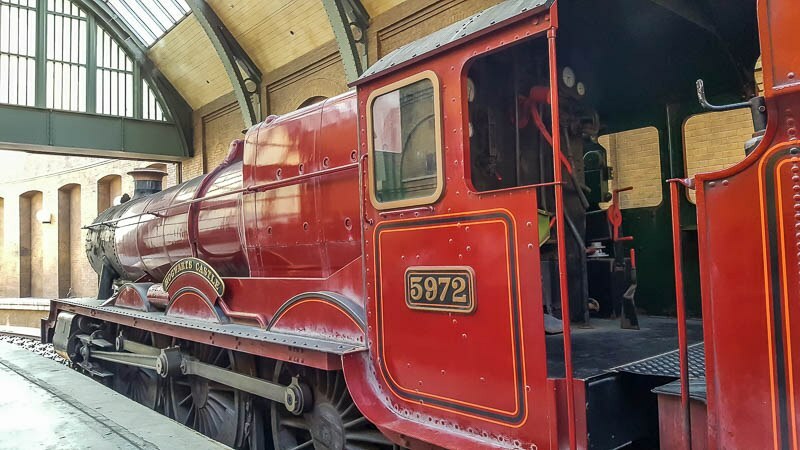 Even if you’re not a huge Harry Potter fan, taking the Hogwarts Express between Universal Islands of Adventure and Universal Studios Florida will save you a lot of time, and let you rest your weary feet. There are so many places to eat at the park, and it’s such a huge walk to parking, that you’ll definitely want to stay onsite for meals. There’s something for every taste at Universal. You can save some money by getting one of several different dining plans that are offered by Universal. What you get really depends on your appetite, who’s in your party, and how long you’ll be at the parks. Check the different options. Tip! You can get ice tap water free throughout the park! Just ask! There are so many places to grab a bite here that we haven’t been able to try them all (or even a good percentage of them), but here are a few we loved. As you’d expect, there are plenty of Harry Potter themed restaurants (and butterbeer!) at the Wizarding World of Harry Potter. We really loved the Three Broomsticks, but the Leaky Cauldron gets great reviews as well. 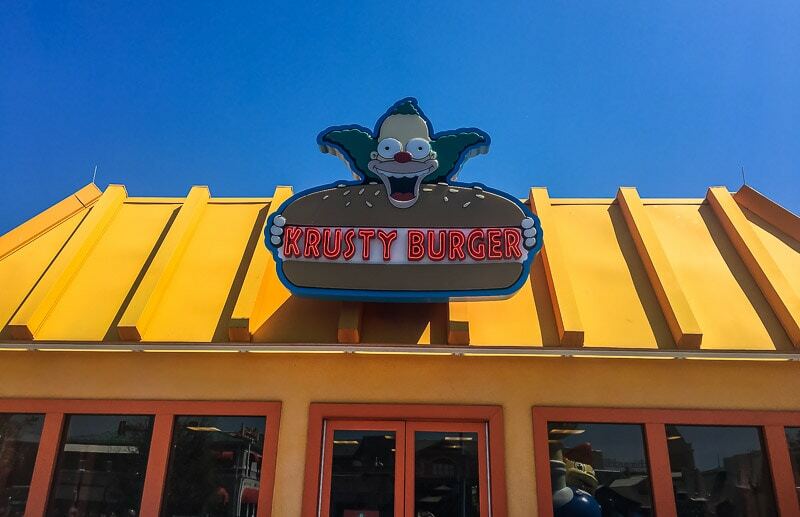 If you’re looking for a good burger, we liked Crusty Burger in Universal Studios. It’s a Simpson’s themed restaurant, with a big selection, and a lot of seating. We had the vegetarian black bean burger, and a regular burger, both of which come with tasty Cajun onion rings. Our littlest had a cheese pizza, and we washed it all down with incredibly thick chocolate milkshakes . 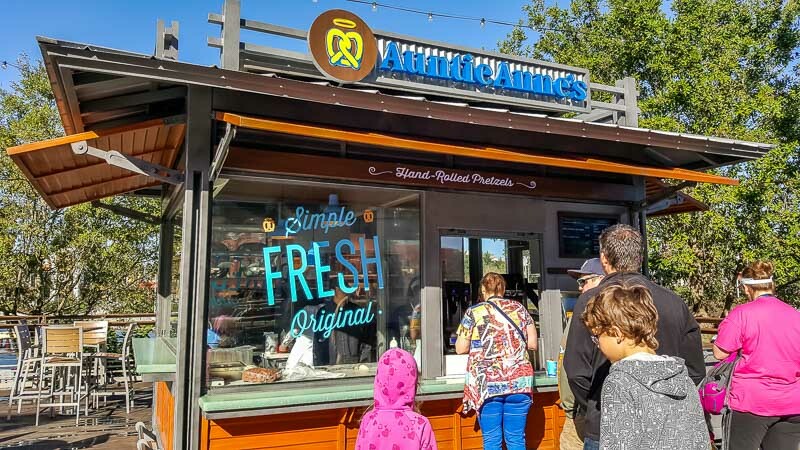 Our go to snack is always Auntie Annie’s Pretzels at Universal Studios for a warm bucket of cinnamon sugar pretzel nuggets to share. The only negative is that there’s almost always a line during busy times. There’s a huge selection of restaurants at CityWalk, which you pass when you first walk into Universal Orlando on your way to the main entry gates. 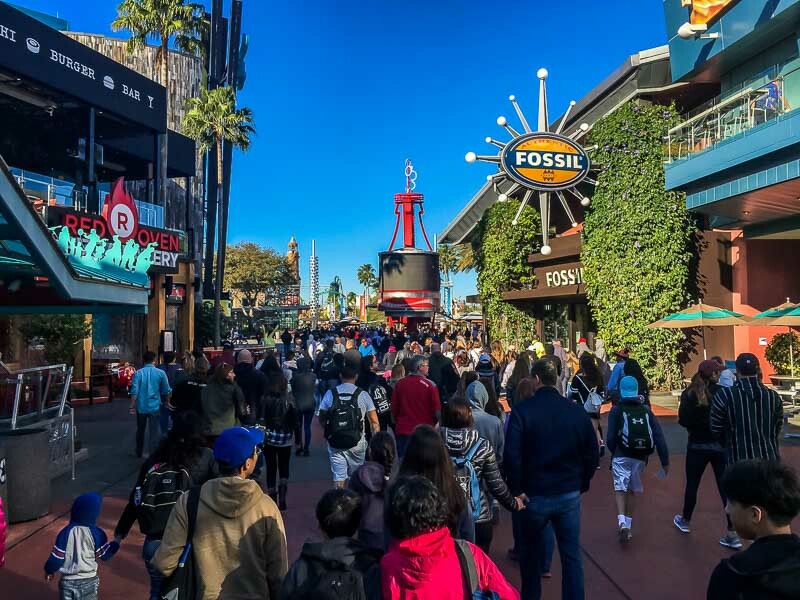 CityWalk is a great choice for a bite at the end of the day, since it’s on your way to the parking lot. 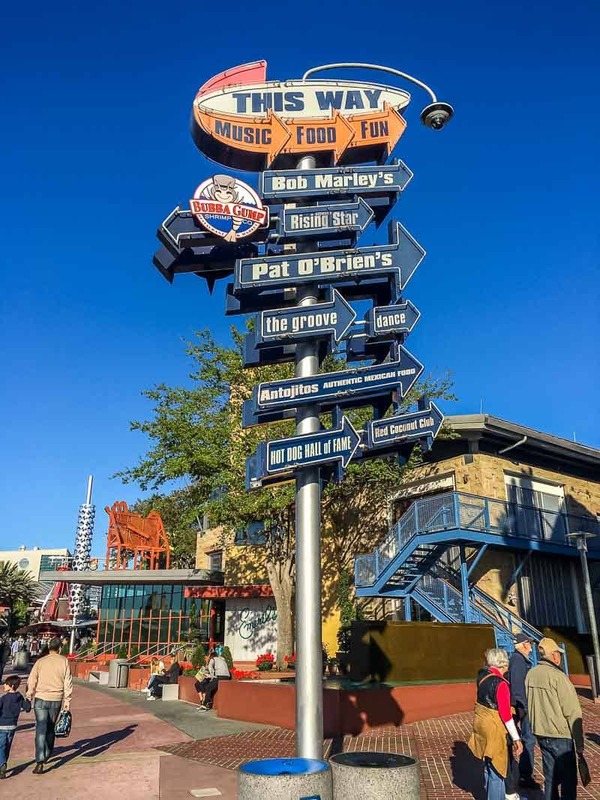 There are dozens of restaurants here, including Bubba Gump Shrimp Co., Hard Rock Cafe, Jimmy Buffet’s Margaritaville, Johnny Rockets and so much more. 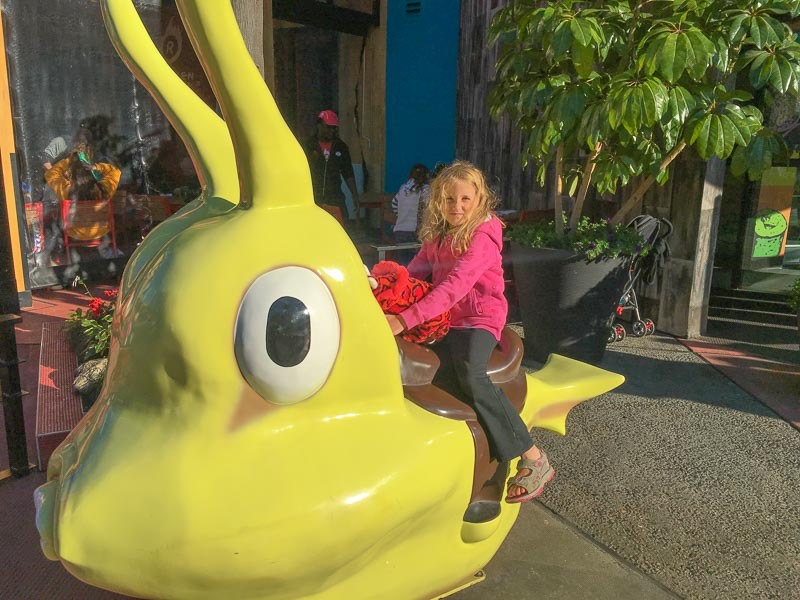 While you’re grabbing a bite to eat at CityWalk, you can also check out mini-golf, clubs, shows, movies, karaoke and concerts. You don’t need a ticket to Universal to get into Universal CityWalk so you’re free to come on your off days as well. If you have any special dietary requirements (vegetarian, gluten free, allergies, and so on), choose your restaurant wisely. We had three vegetarians in our group, and there were veggie options at every restaurant we visited, but we were definitely limited in what we could eat. 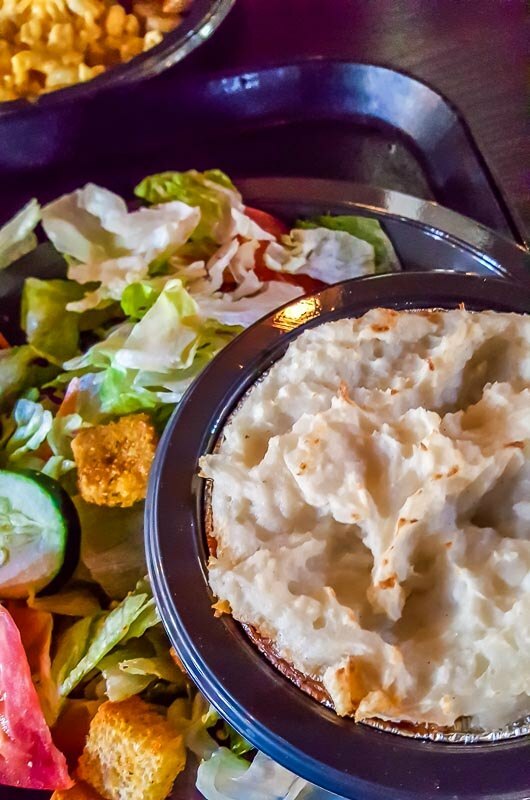 For example, at the Leaky Cauldron in Universal Studios, they only had soup and salad as a vegetarian option, so we decided to eat elsewhere. 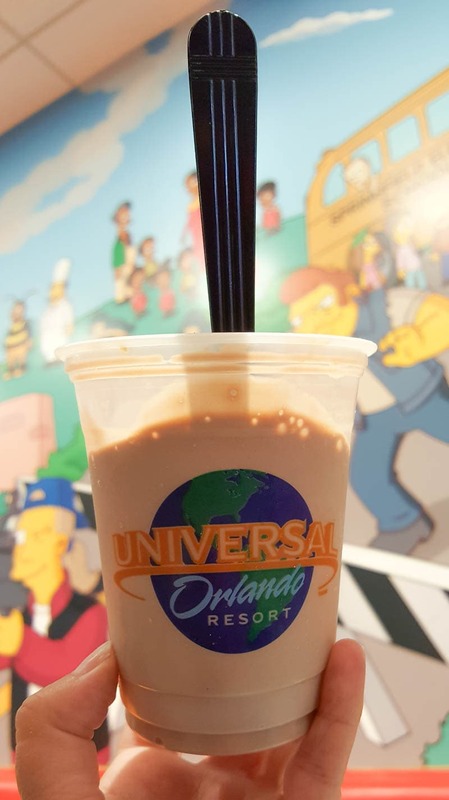 Use the Official Universal Orlando® Resort App (get it on iTunes here | Google Play) or check out the Universal Orlando website to check out menus in advance. Yes, I know you’ve traveled all this way to go to Universal Studios in Orlando Florida however, most multi day passes are good for a week. That means that if you bought a 2 day pass, you can go on day 1 and day 7 instead of going back to back days. Why, you might ask? Between the miles and miles of walking, the crowds, the sights, the rides and the food, a full day at Universal will be tiring. Doing two full days back to back can overload even the hardiest of theme park lovers. Our suggestion, if you have the time, skip a day or two and take in quieter sites for those days or sleep in and enjoy the pool and food at your hotel. That way, once you’ve gotten your wind back, you can fully enjoy your second or third or fourth day at the park with renewed vigor! If you only have a day at Universal Orlando, you’re going to need to maximize every second. One way to do this is to splurge out a little with the VIP Experience. 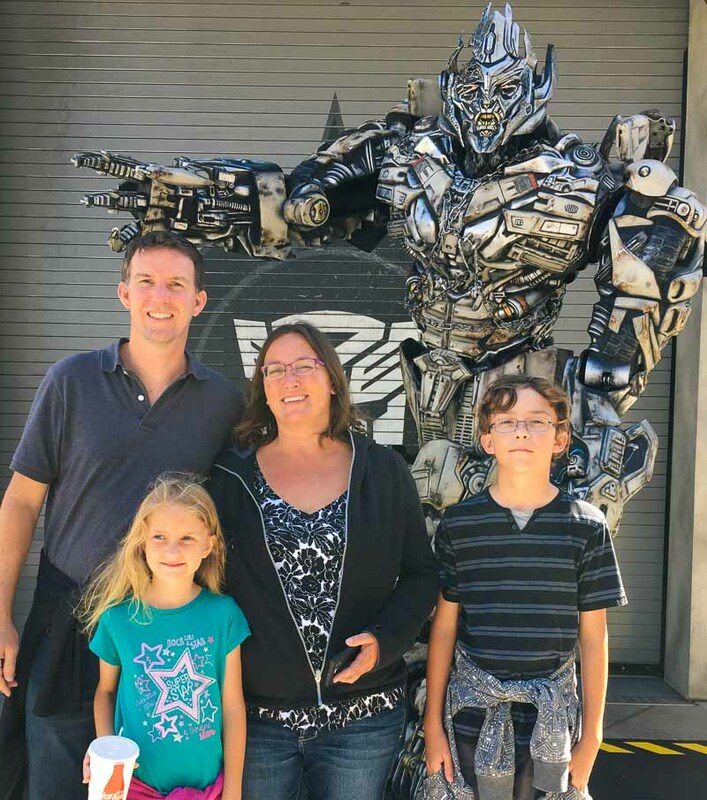 See VIP Experience prices and more on the Universal website here. With a VIP experience, you can skip ALL of the lines. You can also get a personal Universal Orlando tour guide. It also includes a continental breakfast, plus you can choose several other options. The VIP Experience is definitely pricey, but worth considering. A VIP experience gets you priority front-of-the-line access to all rides and attractions, including all of The Wizarding World of Harry Potter attractions and experiences. Plus, you can get behind the scenes tours, complimentary valet parking and reserved seating at shows. You can get a private VIP experience, with just you and your party (which includes two full service meals), or a regular VIP experience. I didn’t know about the VIP experience option when we visited, but it sounds amazing. See information on the VIP experience here. You’re going to be walking all day long within and between parks, and when you’re done, you’ll be walking back to the front entrance and the parking lot. That’s a lot of concrete and if you don’t have good shoes you’ll be done by lunch. I wish I’d worn my Fitbit when we were at the parks last time. I bet I easily put on 20,000 plus steps a day! Since the weather in Orlando can vary depending on the season, bring along a jacket or even a rain poncho if you think you’ll need it. During our last visit, the mornings were cool enough for a jacket, but afternoons were warm enough for shorts and a sleeveless shirt. Don’t forget sunscreen! We forgot ours during our last visit, and I got a mild sunburn just from being outside during 65 degree weather and light cloud cover! Some of the major rides include free lockers right before or after the ride however most of the larger rides won’t even let you take along a phone and wallet with you. Having a backpack isn’t a bad idea but you will be forced to locker it often. We found having clothes with lots of zippered pockets to be helpful and being able to split the family up occasionally meant we didn’t have to rent a locker for the day either. Check for deals before you buy tickets! Before you buy your tickets, be sure to check out Universal’s deals and specials. 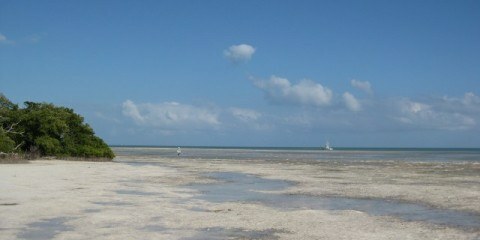 They often have some fantastic deals, and offer special rates for Florida residents as well. Right now Universal has a fantastic special, where you get TWO extra days FREE if you buy a two day Park to Park pass. Check prices for a two day Park-To-Park pass, with an extra day FREE here. See Universal Orlando’s deals here. Orlando such a great place for enjoyment and fantastic Universal park views and delicious food. Wow! that’s such an amazing place to explore. Loved it.